Copyright © 1990-2010 by DisplayMate Technologies Corporation. All Rights Reserved. This is Part II of a comprehensive multi-part article series with in-depth measurements and analysis for the OLED and LCD displays on the Google Nexus One, the Apple iPhone 3GS and the Motorola Droid. It is produced as a collaboration between DisplayBlog and DisplayMate Technologies. We will show you the good, the bad, and also the ugly unfinished rough edges and problems lurking below the surface of each of these displays and display technologies. Each article will be introduced and discussed on DisplayBlog by Jin Kim, followed up with a detailed technical analysis and measurement data on the DisplayMate website. Part I deals with the Google Nexus One, Part II with the Apple iPhone 3GS, and Part III is a detailed point-for-point Shoot-Out comparison between the displays on Nexus One and the iPhone. Part IV deals with the Motorola Droid. The series continues with the Samsung Galaxy S and the Apple iPhone 4. Finally, there is a five way Smartphone "Super" LCD-OLED Display Technology Shoot-Out that compares all of the units simultaneously. There have been lots of articles and discussions comparing the iPhone and Nexus One displays, but no one has yet done anything more than superficial eye ball commentary. This article is an in-depth scientific analysis of the iPhone display. The iPhone has a traditional LCD display with a White LED backlight. The screen is 3.5 inches diagonally and has a medium-resolution medium-density 480x320 pixel display with a screen Aspect Ratio of 1.50, which is lower than the Nexus One’s 1.67, and also lower than standard widescreen displays, which have an Aspect Ratio of 1.78. The inner details of the display technologies are very interesting, but our concern here is to evaluate the actual image and picture quality that they deliver, so we don’t really care how they do it, as long as they do it well. None-the-less with the measurements and analytical test patterns we will learn quite a bit about how they work. Note that we are testing and evaluating the display on the iPhone with whatever hardware, firmware, OS and software are provided by Apple. Figure 1. Revealing Screen Shots for the Google Nexus One and Apple iPhone 3GS. The test patterns are 24-bit bmp at the native resolution of each display. The display was evaluated by downloading 24-bit native resolution 480x320 test patterns and 24-bit HD resolution test photos to the phone. Note that we are testing and evaluating the display on the iPhone with whatever hardware, firmware, OS and software are provided by Apple. The iPhone uses 18-bit color, which provides 64 possible intensity levels for each of the Red, Green and Blue sub-pixels that are used to mix and produce all of the on-screen image colors. That’s relatively good but not great, and would produce visible false contouring in many images and photos were the iPhone not also using dithering to emulate full 24-bit color, which is what is found on most monitors and HDTVs, and provides 256 intensity levels and a nice color and intensity scale with few visible artifacts. Figure 1 shows the smooth intensity scale for both a photograph and test pattern that are visibly free of artifacts on the iPhone. The image and picture quality on the iPhone are very good across the board, including text, icons, and menu graphics. In the important category of images, pictures and photographs from external sources, whether they be from digital cameras or web content, are rendered quite well, except that the LCD panel is weak in color saturation and contrast – much more on that below. The calibration is very good and the images and photos are rendered relatively artifact free, including the critical rescaling function that is needed to fit images, photos and web content onto the native 480x320 resolution of the display. The one surprise is that the iPhone shows some minor compression and/or scaling artifacts for images that are already at its exact native resolution. The Measurements section below has details of all of the lab measurements and tests with lots of additional background information and explanations including the display’s Maximum Brightness and Peak Luminance, Black Brightness, Contrast Ratio, Screen Reflectance, Bright Ambient Light Contrast Rating, Dynamic Color and Contrast, Color Temperature and White Chromaticity, Color Gamut, Intensity Scale and Gamma, the variation of Brightness, Contrast Ratio and Color Shift with Viewing Angle, the Power Consumption and Light Spectrum of the display. We compared the iPhone side-by-side to a calibrated Professional Sony High Definition Studio Monitor using a large set of DisplayMate Calibration and Test Photographs. All of the photos on the iPhone had way too little image contrast and color saturation, to the point of appearing washed out, pale and flat, particularly faces and well known objects such as fruits, vegetables, flowers, grass, even a Coca-Cola can. 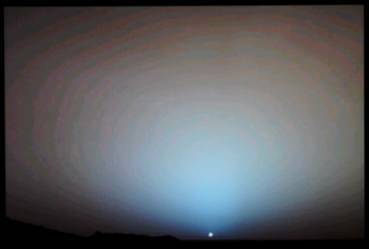 This is the result of too small a Color Gamut and too shallow an Intensity Scale. The overall factory calibration and quality control for the iPhone display are very good. The accuracy of the white point and color and gray-scale tracking are good. The images are relatively free of objectionable artifacts. The color accuracy is also good within the limitations of the LCD panel hardware. The one major flaw in the factory calibration is the shallow intensity scale, which reduces image contrast and even color saturation. The display Look Up Tables should be changed to deliver a steeper Gamma closer to the standard value of 2.2. While the displays for the iPhone and iPod Touch were nice in 2007 when they were first introduced, they now lag significantly in terms of what is possible and practical in a mobile display. The iPhone needs a major display makeover! While OLED will almost certainly overtake LCD, Plasma and most other display technologies in the near future, it is not yet the best performing technology for mobile displays. So if you are able to resist the current pressure for OLEDs, please stick with a nice high-performance, high-resolution, high-contrast, low screen reflectance, 24-bit color depth, standard color gamut LCD for the next generation iPhone. This article is a lite version of our intensive scientific analysis of smartphone and mobile displays – before the benefits of our advanced mathematical DisplayMate Display Optimization Technology, which can correct or improve many of the deficiencies – including higher calibrated brightness, power efficiency, effective screen contrast, picture quality and color and gray scale accuracy under both bright and dim ambient light, and much more. If you are a manufacturer and want our expertise and technology to turn your display into a spectacular one to surpass your competition then Contact DisplayMate Technologies to learn more. This section explains all of the measurements incorporated in the article. The display was evaluated by downloading 24-bit native resolution 480x320 test patterns and 24-bit HD resolution test photos to the iPhone. Note that we are testing and evaluating the display on the iPhone with whatever hardware, firmware, OS and software are provided by Apple. All measurements were made using DisplayMate Multimedia Edition for Mobile Displays to generate the analytical test patterns together with a Konica Minolta CS-200 ChromaMeter, which is a Spectroradiometer. All measurements were made in a perfectly dark lab to avoid light contamination. All devices were tested with their Backlight set for maximum brightness with the Automatic Brightness light sensor control turned off, and running on their AC power adapter with a fully charged battery, so that the battery performance and state was not a factor in the results. For further in-depth discussions and explanations of the tests, measurements, and their interpretation refer to earlier articles in the DisplayMate Multimedia Display Technology Shoot-Out article series and the DisplayMate Mobile Display Shoot-Out article series. This is the maximum brightness that the display can produce, called the Peak White Luminance. 428 cd/m2 is about as bright as you’ll find on any current mobile display. It’s fine for just about everything except direct sunlight, although it may be too bright for comfortable viewing under dim ambient lighting. If you find that to be the case, turn on the iPhone’s Auto-Brightness, which uses a light sensor to adjust the Peak Brightness settings. Since that can be used to decrease the power used by the backlight it will also increase the battery run time. The Black Level is the closest approximation to true black that the display can produce. Almost all displays wind up producing a visible dark gray on-screen instead of true black. This is a major problem for LCDs. The glow reduces image contrast and screen readability and can be distracting or even annoying in dark environments. 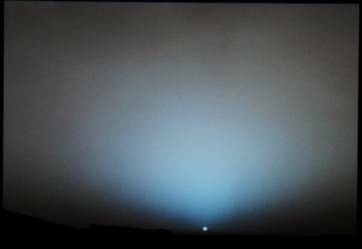 It ruins the dark end of the display’s intensity/gray scale and washes out colors in the image. But note that in bright ambient lighting the Black Level is irrelevant because reflections off the screen dominate the screen background brightness. The iPhone has the brightest black we have ever measured. It’s quite noticeable in all but the brightest ambient lighting environments. Note that if you decrease the Peak Brightness with the (Backlight) Brightness Control, the Black Brightness will also decrease proportionally by the same amount, but you’re pretty much still guaranteed to notice the Black Level because it is always 1 percent of the Peak Brightness. The Contrast Ratio is a measure of the full range of brightness that the display is capable of producing. It is the ratio of Peak Brightness to Black Level Brightness. The larger the Contrast Ratio the better, but it is only relevant for low ambient lighting because reflections off the screen dominate the display’s Black Level in bright ambient lighting. Good quality LCD displays now routinely deliver (true) Contrast Ratios of at least 1,000 and many exceed 1,500, so it’s hard to understand why Apple is still using such a low performance LCD display on the iPhone. The iPod Touch uses a similar display. The often overlooked Screen Reflectance is actually the most important parameter for a mobile display, even more important than Peak Brightness. The screen reflects a certain percentage of the surrounding ambient light, which adds to the screen background, washes out the image, and makes it harder to see what is on the screen. In high ambient lighting the Screen Reflectance can significantly reduce the visibility and readability of screen content. The lower the Screen Reflectance the better. The value for the iPhone of 9.2 percent is among the lower values we’ve measured for mobile devices. Lowering the Screen Reflectance increases the cost of a display, but it’s the easiest and best way to improve screen readability under bright ambient light. The Screen Reflectance measurements were done in accordance with VESA FPDM 308-1, Reflectance with Diffuse Illumination, using an integrating hemispherical dome and a calibrated diffuse white reflectance standard. In the same way that the Contrast Ratio measures the screen contrast under low ambient lighting, the Contrast Rating specifies the relative screen contrast under high ambient lighting. 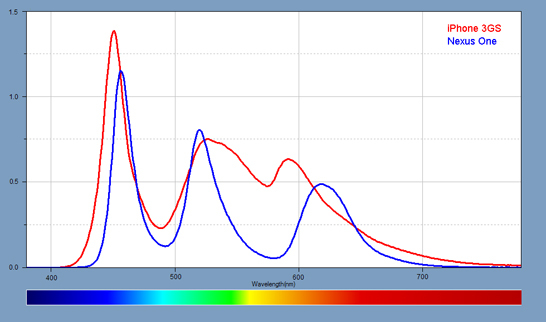 It is the ratio of Peak Brightness to Screen Reflectance. The higher the value the better you’ll be able to see what’s on the screen when you are in a bright location. 47 is relatively high, so the iPhone is among the best mobile displays for high ambient lighting. For all mobile devices the High Ambient Light Contrast Rating is much more important than the Contrast Ratio. Some displays dynamically adjust the color, gray scale and contrast on every image that is displayed using an internal automatic image processing algorithm. The goal is to jazz up and “enhance” the picture by stretching and exaggerating the colors and intensity scale. It is similar to the Vivid mode found in many digital cameras and HDTVs. Since it alters and frequently distorts the image it is better left as an option for people who aren’t concerned with picture accuracy and fidelity. Since the Dynamic modes are generally triggered by changes in Average Picture Level, a very simple test for Dynamic Contrast is to separately measure the brightness of full screen Red, Green and Blue images and then compare them to White, which should equal their sum. If they don’t agree then there is Dynamic Color and Contrast processing. For the iPhone, the measured Luminance for Red=84, Green=288 and Blue=65 cd/m2. Their sum is 437 cd/m2, which is just 2 percent different from the measured value for White, 428 cd/m2, so the iPhone doesn’t utilize Dynamic Color and Contrast, which is best for picture quality and accuracy. White is not a single color but rather falls within a range that is normally specified by a Color Temperature. For accurate color reproduction of most content, including photographs, images and web content it needs to be the industry standard D6500, which is how most professional photo and video content is color balanced. D6500 is the color of natural daylight and is similar to a Black Body at 6500 degrees Kelvin. The iPhone’s White Point is actually fairly close to D6500 – see the White Points in Figure 2 below. The measured CIE Chromaticity Coordinates of the White Point are u’=0.1903 v’=0.4692. The Color Gamut of a display is the range and set of colors that it can produce. The only way that a display will deliver good color and gray scale accuracy is if it is accurately calibrated to an industry standard specification, which for computers, digital cameras, and HDTVs is sRGB or Rec.709. It’s the standard for most content and necessary for accurate color reproduction. If the Color Gamut is smaller than the standard then the image colors will appear too weak and under-saturated. If the Color Gamut is greater than the standard then the image colors will appear too strong and over-saturated. The important point here is that a Color Gamut larger than the standard is also bad, not better. Wider gamuts will not show you any colors or content that are not in the original images, which are almost always color balanced for the sRGB / Rec.709 standard. Wider color gamuts simply distort and decrease color accuracy and should be avoided, except for some special applications. 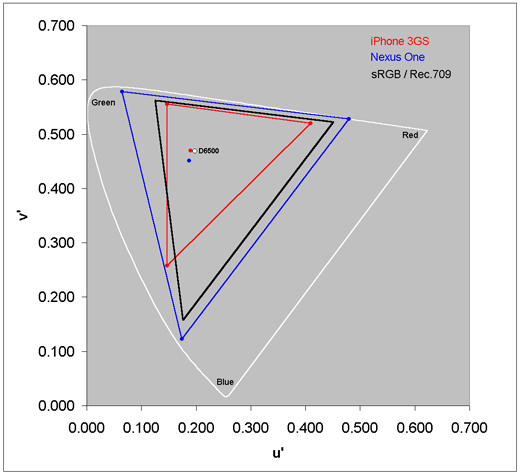 Figure 2 shows the measured Color Gamut for the Nexus One and the iPhone 3GS alongside the Standard sRGB / Rec.709 Color Gamut in a CIE 1976 Uniform Chromaticity Diagram. The dots in the center are the measured White Points for the phones along with the D6500 Standard, which is marked as a white circle. The outermost curve are the pure spectral colors and the diagonal line on the bottom right is the line of purples. A given display can only reproduce the colors that lie inside of the triangle formed by its primary colors. Highly saturated colors seldom occur in nature so the colors that are outside of the standard sRGB / Rec.709 triangle are seldom needed and are unlikely to be noticed or missed in the overwhelming majority of real images. When a camera or display can’t reproduce a given color it simply produces the closest most saturated color that it can. Both displays perform poorly with reference to the standard Color Gamut, which is the black triangle in Figure 2. The iPhone has much too small a color Gamut and the Nexus One has much too large a color Gamut. As a result the iPhone produces images that have significantly too little color saturation and the Nexus One produces images that have significantly too much color saturation. This applies to all external content viewed on the displays, including web content, such as images, photos and videos. This was easy to see in the viewing tests where we compared the displays side-by-side to a calibrated Professional Sony High Definition Studio Monitor using a large set of DisplayMate Calibration and Test Photographs. Nexus One photos had way too much color, to the point of appearing gaudy, particularly faces, and well known objects such as fruits, vegetables, flowers, grass, and even a Coca-Cola can. The iPhone had the reverse problem, all of the photos looked somewhat pale, flat, washed-out and under-saturated. 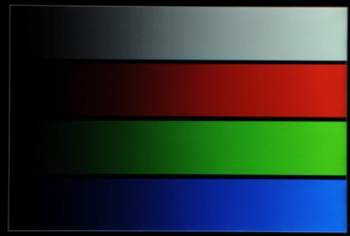 The display’s intensity scale not only controls the contrast within an image but it also controls how the Red, Green and Blue primary colors mix to produce all of the on-screen colors. So if it doesn’t obey the industry standard intensity scale then the colors and intensities will be wrong everywhere on-screen because virtually all professional content and all digital cameras use the sRGB / Rec.709 standard, so it’s necessary for accurate image, picture and color reproduction. The standard intensity scale is not linear but rather follows a mathematical power-law, so it is a straight line on a log-log graph. Its slope is called Gamma, which is 2.2 in the standards. In order to deliver accurate color and intensity scales a display must closely match the standard. Figure 3 shows the measured (Transfer Function) Intensity Scale for the Nexus One and iPhone 3GS alongside the industry standard Gamma of 2.2, which is a straight line. Both displays perform poorly with respect to the standard intensity scale, which is needed in order to accurately reproduce images and pictures for most content. Over the entire range the iPhone has much too shallow an intensity scale, which reproduces images with too little contrast and reduces the saturation of most colors. Gamma is the slope of the intensity scale, which should be a constant 2.2 like the straight line in Figure 3. In the central 20 to 80 percent signal range the Gamma for the iPhone is 1.90, which is noticeably too shallow and produces images that appear somewhat washed out with too little contrast. The curve is concave, so the Gamma and contrast continue to progressively decease at low intensities. A major problem with many displays, especially LCDs, is that the image changes with the viewing angle, sometimes dramatically. The Peak Brightness, Black Luminance, Contrast Ratio and color generally change with viewing angle (see below). Some display technologies are much better than others. At a moderate 30 degree viewing angle the Peak Brightness of the iPhone fell by 63 percent to 161 cd/m2, which is an incredibly large decrease. At a moderate 30 degree viewing angle the Black Level Brightness increased by 19 percent to 3.7 cd/m2 and Contrast Ratio fell to an abysmal 44. 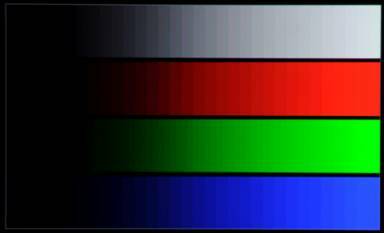 Colors generally shift with viewing angle whenever the brightness shifts with viewing angle because the Red, Green and Blue sub-pixels each shift independently and vary with intensity level. At a moderate 30 degree viewing angle Red shifted the most, by Δ(u’v’) = 0.0418, which is 10 times the Just Noticeable Color Difference. Green by Δ(u’v’) = 0.0105 and Blue shifted the least by 0.0066. These are in the range expected for LCDs. The power consumed by LCD displays is independent of the brightness and color distribution of the images – it only depends on the Brightness setting of the backlight that illuminates the LCD from behind. The Auto-Brightness option allows the ambient light sensor on the iPhone to adjust the backlight brightness and power setting as the ambient light changes. This not only improves visual comfort but can also increase the battery run time. It is possible to indirectly determine the power used by the display by measuring the AC power used by the iPhone with different backlight settings. The average power used when the display is dark in standby mode is used as the baseline and is subtracted from the power measured for the other states. Table 1 lists the Measured Relative Power, the Measured Luminance, and the Relative Luminous Efficiency, which is just the Measured Luminance divided by the Measured Relative Power, and normalized to 1.0 for White, which has the highest total efficiency. The spectra of an LCD display is just the spectrum of the backlight filtered through the individual Red, Green and Blue sub-pixel filters within the panel. OLEDs are emissive devices so the spectra of the Nexus One is just the sum of the individual Red, Green and Blue OLED spectra, modified slightly by the touchscreen layer and anti-reflection absorption layer through which their light must pass. We thought it would be very useful and interesting to compare the spectra of the Nexus One with the spectra of the iPhone 3GS, so we asked Konica Minolta to loan us their flagship CS-2000 Spectroradiometer to perform the measurements. 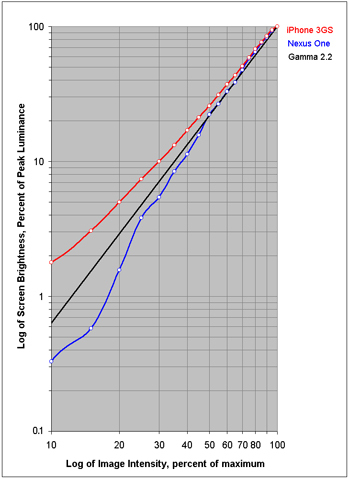 The spectra for White, which is the sum of the Red, Green and Blue primaries is shown in Figure 4 for both the Nexus One and iPhone 3GS. As expected the OLED RGB spectra are relatively narrow because of their high color saturation. The iPhone LCD RGB spectra is a filtered broadband spectrum. The backlight for the iPhone is a white LED, which consists of a Blue LED with a yellow phosphor. Special Thanks to Jay Catral of Konica Minolta for visiting our Lab and bringing the CS-2000 Spectroradiometer to measure the Spectra and the very dark Black Luminance of the Nexus One. And Special Thanks to Konica Minolta Sensing for loaning us the CS-2000 and sending Jay Catral. DisplayMate Technologies specializes in advanced mathematical display technology optimizations and precision analytical scientific display diagnostics and calibrations to deliver outstanding image and picture quality and accuracy – while increasing the effective visual Contrast Ratio of the display and producing a higher calibrated brightness than is achievable with traditional calibration methods. This also decreases display power requirements and increases the battery run time in mobile displays. This article is a lite version of our intensive scientific analysis of smartphone and mobile displays – before the benefits of our advanced mathematical DisplayMate Display Optimization Technology, which can correct or improve many of the deficiencies – including higher calibrated brightness, power efficiency, effective screen contrast, picture quality and color and gray scale accuracy under both bright and dim ambient light, and much more. Our advanced scientific optimizations can make lower cost panels look as good or better than more expensive higher performance displays. For more information on our technology see the Summary description of our Adaptive Variable Metric Display Optimizer AVDO. If you are a display or product manufacturer and want our expertise and technology to turn your display into a spectacular one to surpass your competition then Contact DisplayMate Technologies to learn more. Screen Resolution: This site best viewed at a resolution format of 1024x768 or 1280x1024 pixels.